Is it illiberal to say that these women are "more Danish than African immigrants"? It is hard to imagine a more disingenuous reply than Matt McManus’s response to my assessment of his review of Canada in Decay. When I said Germany and Spain were liberal nations before the globalist rulers decided to embrace mass immigration, I was not denying the historical reality of fascism in these nations. McManus knows this. A clearly stated claim of my assessment was that—if we insist immigrant diversity is an intrinsic requirement of liberalism and that any opposition to diversification is racist and illiberal—we would have to identify the nations that fought fascism during WWII as racist and fascist. We would have to say all European nations were illiberal up until they adopted multicultural citizenship sometime after the 1980’s, even though they were full-blown liberal democracies with equal rights for all citizens regardless of ethnicity. When and why Western nations came to the decision that they should be classified as fascistic unless they committed themselves to diversity—and to the replacement of their ethnic millennial identities with a multicultural identity—is a key question of Canada in Decay. When did “liberals” decide that there is no such thing as a native “Dane” or a “Frenchman” with ancestral ties anymore than there is no such thing as a foreigner-to-be-immigrant who is not a “Dane” or a “Frenchman”? Another central claim of my book is that there is nothing in the meaning of a liberal nation that requires such a nation to import millions of new minorities. Liberalism only requires the recognition of the equal rights of historical minorities already inside the nation. The claim that liberalism requires diversification is a result of the infiltration of liberalism by conniving cultural Marxists. McManus keeps harping away against the term “cultural Marxism” because he imagines himself to be a true liberal in his establishment call for the diversification of all European nations. He wonders how this label could be used against Kymlicka, Charles Taylor, and conservatives alike when none of them were “Marxists.” “What any of it has to do with Marxism, cultural or otherwise, is beyond me,” he writes. “Marxism is about nothing if it is not a critique of capital and capitalist societies.” It looks like the term “cultural Marxism” is not clearly understood in his response. It is, however, a very common term in the dissident right. I defined this term formally in my book, Faustian Man in a Multicultural Age (2017). In Canada in Decay, its meaning is contextualized within a long narrative, in the same way that leftists use a whole array of terms without offering formal definitions (“capital”, “capitalist societies,” or “Marxism”) because these terms are common knowledge in their circles. The expectation is that one should define these terms only if one’s argument is directly about them, but otherwise, readers are generally satisfied with contextual meanings. 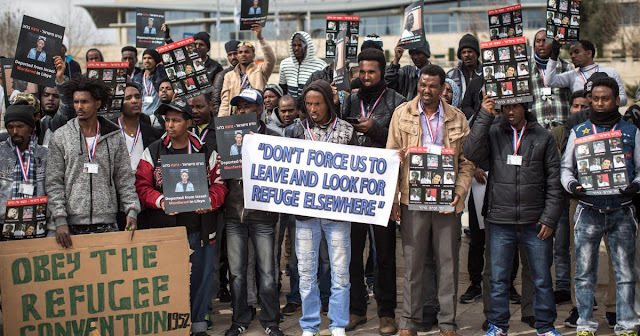 Is it illiberal to say these African migrants are not "truly Danish"? But since McManus makes a basic error in confusing “cultural Marxism” with Marx’s economic critique of capitalism, let me clarify for readers that the word “cultural” is used to signal the spread of the idea (not among liberals at the time but among radical leftists in the 1960s) that bourgeois cultures could be radically transformed through the abolition of male and female traditional roles, the replacement of Christian morals with politically correct morals, and the promotion of “critical race politics” for blacks, aboriginals, and minorities generally. The idea that multicultural citizenship should be promoted in all Western nations took off later, slowly in the 1970s in Canada, Australia, and the United States, and then in Europe after the 1980s, roughly speaking. Promoting feminism, gay rights, and immigrant multiculturalism in-through all the major institutional settings of the West, the schools, media, books, universities, churches, came to be known as “the long march through the institutions”. As I show in Canada in Decay, Kymlicka regularly uses this phrase in his writings in reference to the successful imposition of multiculturalism in every corner of Canadian life. Having said this, I don’t think it is an exaggeration to equate cultural Marxism with immigrant multiculturalism insomuch as racial diversification has become the most transformative force in our times, in human history, in the way it is destroying forever the millennial ancestries of European peoples, and only European peoples. The left in the 1960s did not consciously set out, in a programmatic fashion, to push diversity as their biggest weapon to undermine Western culture, but a weapon indeed it has become, for reasons that I explain in Part Four in Canada in Decay. Promoting diversity is the most important weapon for leftists; they see it as the one weapon that will finally silence white identity and thus disorient the one social agent that is historically and ethnically tied to Western culture. The “long march through the institutions” entailed a march right inside liberalism. Kymlicka was the central theoretical figure in articulating (and promoting across Europe) the argument that liberal nations, if they were to live up to their liberal values, needed to embrace “multicultural citizenship” through the importation of continuous masses of immigrants. Conservatives must be identified as cultural Marxists in the degree to which they caved into the mandate that diversity is the greatest strength of liberal nations. This does not mean Ronald Reagan should be called a cultural Marxist or a “cuckservative” in granting legal status to nearly 3 million illegal immigrants. Timing is very important in our understanding of immigrant multiculturalism. Reagan did this in the 1980s when mass immigration from the Third World was just about to gather momentum; he was a civic nationalist still inhabiting a heavily White nation unable to fully perceive the way diversification would come to be embraced by the left as their biggest weapon of change. Had McManus read Canada in Decay with a scholarly mind, he would have encountered my argument that we should not look upon Pierre Trudeau as someone who intended from the beginning to turn Canada into a “postnational” state. The pathological idea that Canada should be utterly deprived of even a cohesive “Western” national identity is a product of the ongoing takeover of liberalism by cultural Marxist precepts. McManus also knows well that I brought up the fact that my book is a bestseller only in reply to his supposition that the polemical style of my book would impede it from “reaching a wide audience.” It did not; it is a beautiful best seller. Canadians are fed up with the lies, the threats, the illiberal character of immigrant multiculturalism; they long for a real critique rather than yet another cuckservative begging for the “assimilation” of endless throngs of Africans, Muslims, and Asians. McManus is equally disingenuous in his effort to mock my observation that I am the “only academic” to question immigrant diversity. He tries to deceive his readers by using the term “critique of multiculturalism” as if I am just one among millions of conservatives who are critics of multiculturalism. He brings up a rather bizarre link to an interview of Sebastian Gorka, former deputy assistant to President Trump, as an example of the many academics out there who are into white identity politics. Gorka is not an academic and is not a critic of immigration per se—but a civic nationalist who is critical of illegal immigration. It is very odd that in the same vein as he tries to paint me as a “white supremacist” he tries to mock my observation that I have been unfairly vilified. I am not going to get into details about matters that are internal to universities except to say that a high number of articles in the major papers of Canada have voiced strong opposition to my status as a professor, including numerous emails and letters sent to the university, formal and informal, including one to the Toronto Star signed by an entire sociology department, to say the least. It is disingenuous to pretend one does not know about the many studies that have been published on the bias in our universities against conservatives, never mind against white identitarians. The last paragraphs of McManus’s reply are all about how my concept of European ethnicity is “problematic.” One thing students are taught in our universities is to say that all the concepts not approved by leftist professors are “problematic” and that the task of the student is to “problematize” the “problematic” concepts. One might think the terms “race” and “ethnicity” are inherently “problematic” for leftists. Actually, these terms are not one bit problematic as long as one follows a very simple formula which goes like this: Blacks, Asians, Aboriginals do exist, and can be identified as “marginalized minorities” in need of affirmative action. These groups can be identified as races because they are “racialized” by a “white supremacist system.” To counter this “racialization” minorities must assert their identities and show pride in their heritage and achievements. McManus says that throughout my book I shift “the goalpost” as to “who warrants ethnic prioritization.” “In the beginning, it is the English and the French. 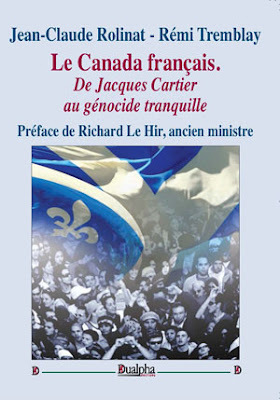 Later he broadens the mosaic to include all people of European background because he alleges they share similar cultures and values.” Sorry, Professor McManus, I deal with facts; in the earlier period of Canada’s history, I emphasize the English and the French for the straightforward reason that they were the overwhelming majority of the Canadian population. I include “other Europeans” for later periods for the simple reason that historical demographic documents tell us that “other Europeans” became important from the late 1800’s onward. I also show that Anglo-Canadians gradually came to accept “other Europeans” as Canadians, and that as late as 1971, the official statistics say that Canada was 96 percent European in ethnicity. Is McMannus correct that Haitian Voodooism is closer to the spirit of Quebec's heritage than Anglo Protestants? McManus brings up “the black Roman Catholic Haitian” to argue that they had more in common with the Quebecois than with the Protestant Europeans I include in my definition of “Euro-Canadian.” No, Haitians don’t have more in common with the Quebecois than other Europeans. 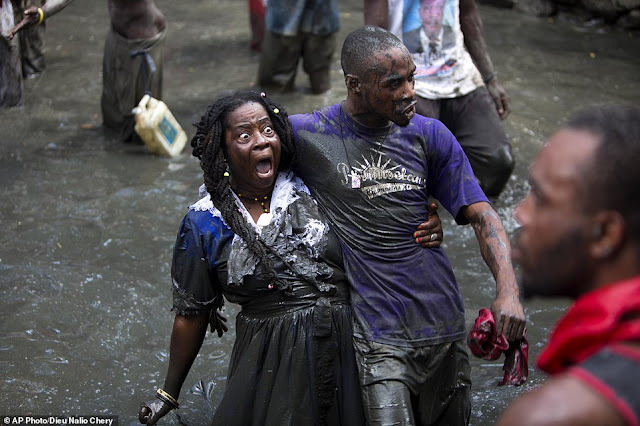 First, it is understood among scholars of Haiti that though Roman Catholicism is the official religion of Haiti, voodoo should be considered the country’s national religion because the majority of Haitians practice voodoo separately and alongside Catholicism. Voodoo is a primitive religion, involving magic and sorcery, inconsistent with the theological precepts of Catholicism endorsed by Europeans, not to mention other fundamental cultural differences and historical experiences. Second, the genetic distance between Quebecois and Haitians is far greater than between them and any other European people. The greater the genetic distance, the greater the genetic loses when your population is being demographically replaced. The scientific research of Frank Salter should be consulted for what it teaches about how it is that even though all humans have common genes, one can still measure the genetic similarities and differences that exist between different ethnic groups. One can make a very rational argument showing that the more two ethnic groups share in genes, the more one can say that their kinship is positive, whereas the less they share in genes, the more one can say that their kinship is negative. I know that in our universities no one is allowed to read the mounting research on the reality of inherited genetic differences between individuals and ethnic groups, but this does not mean that these studies are “hyperbolic” and to be dismissed in a fashion that violates the sacrosanct principle of higher learning and academic freedom we are supposed to respect as university teachers. Canada in Decay is very respectful of higher learning and liberal values—against cultural Marxists. Originally published at Merion West.